Usually doilies only take me a week to finish. I started this 22″ doily, which was designed by Josie Rabier, (and featured in the Crochet World August 2015 issue), at the same time I brought home my puppy, Bodie. That was back in mid-October. Usually doilies only take me a week to finish but with all the canine interruptions it wasn’t complete until last week. The eight petal overlays were something new for me to learn as the base of the petals were attached to one of the beginning rows. That allows the person who blocks it to decide whether to raise each pedal or leave them flat. Of course the doily can be lightly starched as I’ve done here or heavily starched. 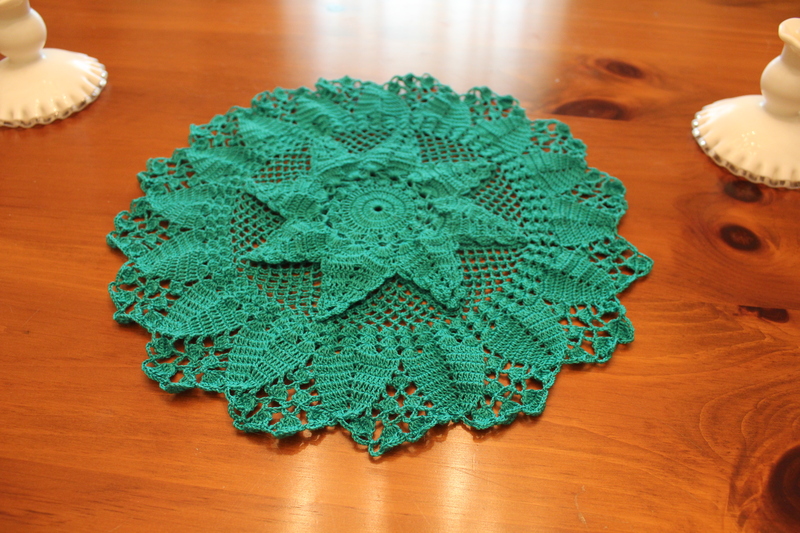 This entry was posted in Crocheted doilies and tagged Crochet World, crocheting, Teal Fantasy Doily. Bookmark the permalink.